We are so thrilled to be partnering with the Wiregrass United Way for these next few months. Every Wednesday, come in and eat breakfast with us and a portion of your purchase will go directly back to Wiregrass United Way! Help those in the Wiregrass who have needs this holiday season by donating non-perishable canned goods throughout November. 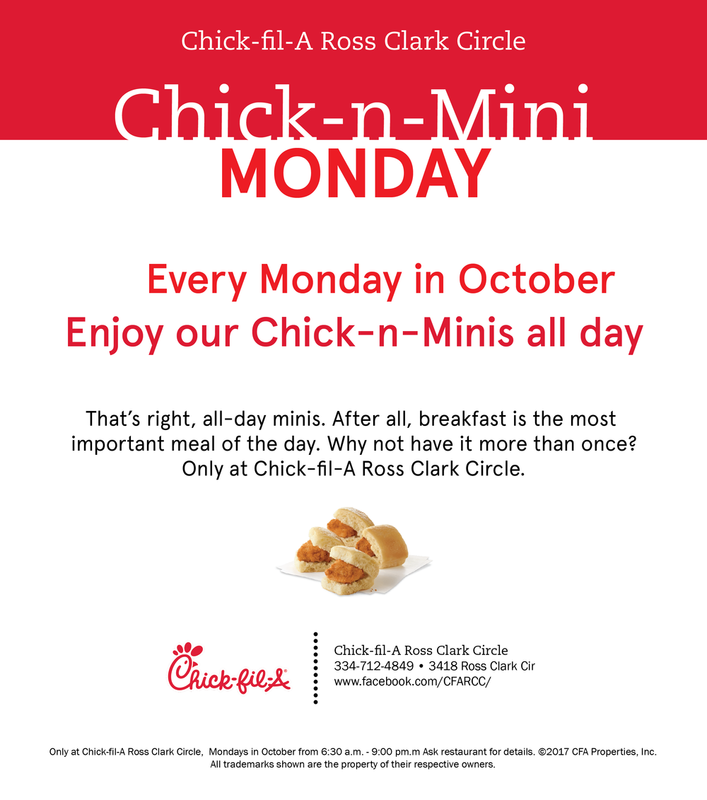 Every Monday in the month of October, we'll be selling Chick-n-Minis all day long! Come and join us for breakfast at our Final 3 Countdown event! 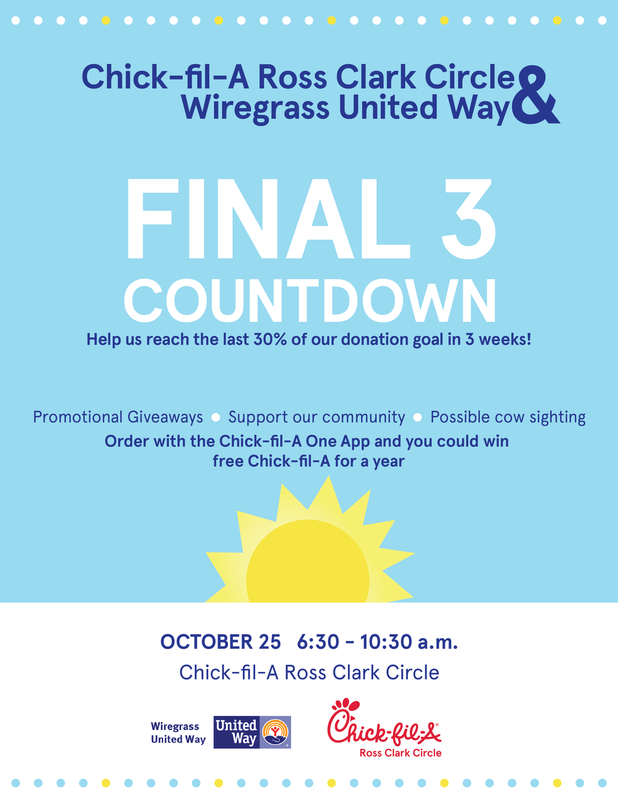 We'll be having promotional giveaways, appearances from the cow and you'll have the opportunity to meet members of Wiregrass United Way. A portion of breakfast proceeds will be going to Wiregrass United Way. 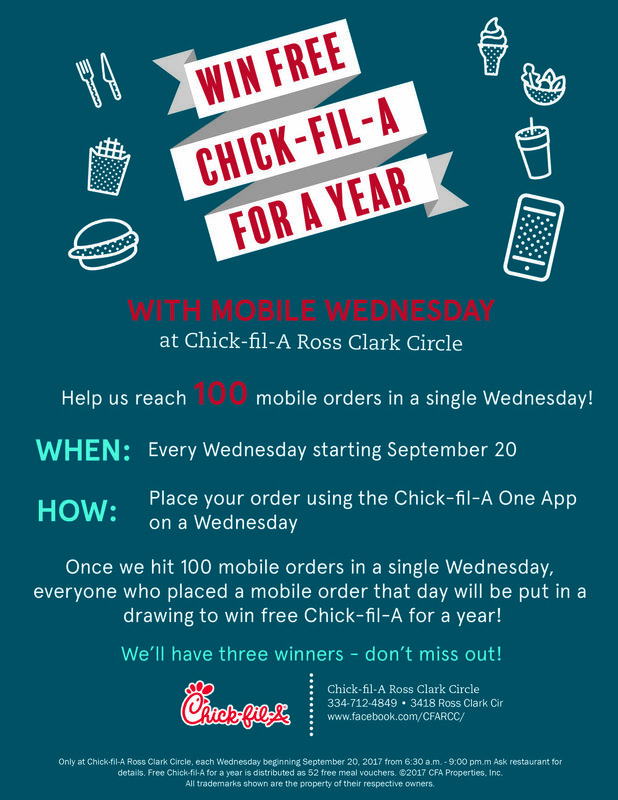 Everyone who places a mobile order any time on Wednesday will be put in a random drawing to win FREE Chick-fil-A for a year! Place a mobile order with the Chick-fil-A One App and you could win free Chick-fil-A for a year! Help us reach 100 mobile orders in a single Wednesday and we'll be drawing 3 guests who placed a mobile order that day. When you order any size Chilled Reheatable Nugget Tray, get either 2 gallons of tea or a small cookie tray for free!